نمایشگاه WIN EURASIA قدرت خود را با حمایت از انجمن تولیدکنندگان ماشین آلات ترکیه افزایش می دهد. WIN EURASIA” ” که بزرگترین و برجسته ترین نمایشگاه صنعت در منطقه اوراسیا است، اکنون با پشتیبانی انجمن تولید کنندگان ماشین آلات ترکیه حضـور قدرتـمندتری خواهد داشت. های (B2B با هدف دسترسی به بازارهای بین المللی همچون مناطق ترکیه و اوراسیا است و هر ساله به عنوان رویدادی پیشرو در زمینه صنایع تولید گام های بزرگتری را بر می دارد. 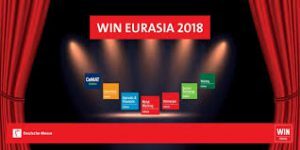 “WIN EURASIA” یک بار دیگر صنایع تولید 360 درجه را از سراسر جهان، در سالن Industry 4.0 در نمایشگاه “TÜYAP” گرد هم می ­آورد. 14 تا 17 مارس 2019 برابر با 23 تا 26 اسفند 1397خواهید بود. فرصت کسب تجربه در زمینه های پیشرفت های تکنولوژیکی از جمله اتوماسیون کردن، دیجیتالی شدن، اینترنت اشیا (IOT)را فراهم می سازد. کارشناسان مورد بحث قرار خواهد گرفت. 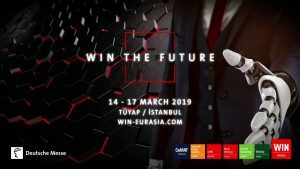 “WIN EURASIA” 2019 STRENGTHENS ITS POWER WITH THE SUPPORT OF TURKISH MACHINE MANUFACTURERS’ ASSOCIATION! “WIN EURASIA” which is the largest and leading industry fair in Eurasia region will now be supported by the Association of Turkish Machine Manufacturers’ and strengthen its power with this significant cooperation. 7th January 2019, Istanbul – Following the announcement made by the Association of Turkish Machine Manufacturers concerning the fact that they will be supporting “WIN EURASIA”, this year Win EURASIA will become stronger with the addition of Turkish Machine Manufacturers who are the manufacturing power of Turkey. “WIN EURASIA” organized in Istanbul by Deutsche Messe’s Istanbul office; Hannover Fairs Turkey; is the leading and largest B2B trade fair for access to international markets as well as Turkey and Eurasia region. Every year as the leading event for manufacturing industry in the region takes a step further in terms of its success. In between 14 – 17 March 2019, WIN EURASIA once again will bring the 360 degrees manufacturing industry from all around the world, under Industry 4.0 roof at TÜYAP Fair and Exhibition Center in Istanbul. Innovations from metalworking to automation, motion and drive systems,from energy and electrical-electronics to intralogistics, from surface treatment to welding technologies will be showcased at 14 – 17 March, WIN EURASIA 2019. 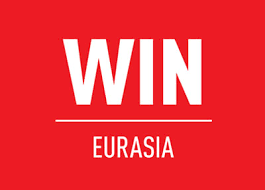 26th International “WIN EURASIA” 2019 which will bring entire ecosystem required for the factories of the future; from steel plate work to metal production technologies, from automation services to bonding and welding technologies, from hydraulic and pneumatic services to on-site logistics, is providing 360 degrees viewpoint to the Manufacturing industry and offering the participants; opportunity to closely experience the technological developments including automation, digitalisation, internet of things (IOT) and augmented reality. In WIN EURASIA where the manufacturing processes and technological innovations come together at 14 – 17 March 2019, under the motto “WIN the Future” within the scope of the Industry 4.0 concept the future vision of the industry will be discussed in conferences with the participation of experts. Members of the Association of Turkish Machine Manufacturers will be participating in the and they will share the level Turkish production and Turkish machine manufacturers have reached with the European and Asian markets in this very important industrial meeting of Eurasia where nearly 2000 local and industrial brands will exhibit, and which is visited by over 75.000 sector professionals from 146 countries at last March, in its 2018 edition. “WIN EURASIA” where the world’s industrial giants will be presenting their latest technologies organized by Hannover Fairs Turkey is also supported by the Ministry of Trade, Ministry of Science, Industry and Technology and KOSGEB in cooperation with the leading institutions of the sector such as MAKFED, İSDER, ENOSAD, AKDER, ETMD.